In one of the strongest signs yet that the Silicon Valley housing market is recovering, the median price of houses sold in Santa Clara County last month shot up 29 percent from a year earlier, hitting $550,000, the biggest year-over-year increase in ... (to read the rest of this article please http://www.mercurynews.com/real-estate-news/ci_14890494)... However, Andrew LePage, an analyst with DataQuick, said "significant threats" still loom from higher interest rates, a weak economy and the likelihood of a rising inventory of homes being sold either after foreclosure or in an attempt to avoid foreclosure. Foreclosures shot up 72 percent in Santa Clara County last month compared with a year earlier — the biggest increase in more than a year — further proof that federal efforts to keep people in their homes have had little effect. A total of 434… (to read the rest of this article please visit http://www.mercurynews.com/real-estate-news/ci_14877464). The Federal tax credit expires Friday April 30th and new homebuyers will burn through the California's state tax credit no later than May 20, the California Association of Realtors, an industry group, said Wednesday. Starting May 1, buyers who haven't owned a home in the previous three years and buyers of new homes will both become eligible for a $10,000 state tax credit… (to read the rest of this article please visit http://www.nctimes.com/business/article_5fb80b8a-7e42-500f-ad3d-bc3851850f15.htm). 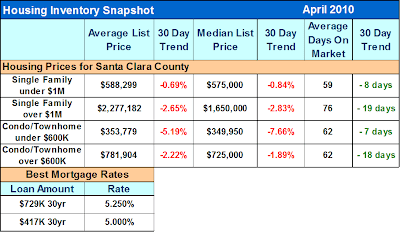 Market Recap: The chart below shows that cities east of highway 880 are continuing to have less inventory. Home prices have risen in these areas as much as 10% in 6 months. Demand has far outweighed supply. 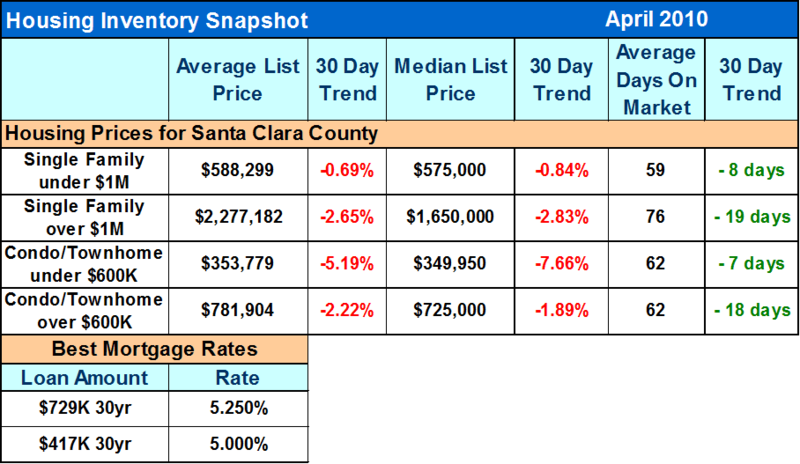 For Comparison: The West side of Highway 880 had more supply than demand in March, which could be a sign of prices falling if the trend continues. Current Prediction: Prices will be stable for the next couple months as we move into uncertain times. With tax credits expiring and interest rates rising the distant future of home prices is unknown but count on me to keep you informed.